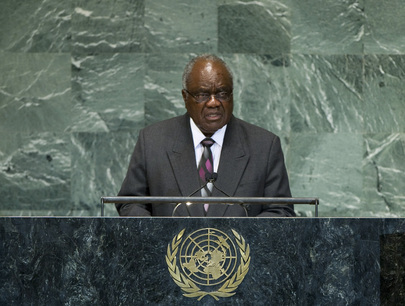 Referring to the theme of the Assembly’s sixty-seventh session, HIFIKEPUNYE POHAMBA, President of Namibia, said that if all people dedicated themselves to finding lasting solutions to conflict by peaceful means, “our collective efforts will be successful”. States should also renew their original commitment to peace and progress as essential values of the United Nations. In that connection, Namibia believed that respect for the sovereign equality of States, territorial integrity and independence constituted the pillars of international law, and, indeed, the “bedrock” of peaceful relations between nations. Any violation of those principles posed a serious threat to international peace and security. Regional and subregional organizations were important partners in solving conflicts throughout the world, he said, and their contribution to conflict resolution was provided for under the United Nations Charter. There was thus a compelling need for the United Nations to take into account the views of such organizations, including, on the African continent, the African Union Peace and Security Council and the Southern African Development Community (SADC). The latter had put in place initiatives to resolve political conflicts in the region through mediation, he said; however, Namibia was concerned about the deteriorating security situation in the Democratic Republic of Congo. He urged the international community to support the regional initiative aimed at resolving that conflict and to provide humanitarian assistance to displaced persons. In Madagascar, he urged political actors to expedite the full implementation of the road map leading to the holding of free, fair, inclusive and credible elections. Namibia also called on Sudan and South Sudan to resolve all outstanding issues peacefully; in the Darfur region, it urged the Government and other parties to find a negotiated peaceful solution to the conflict. He also denounced the unconstitutional changes of government in Mali and in Guinea-Bissau, which took place in March this year. In Somalia, he welcomed the recent positive political developments, including the election of Hassan Sheikh Mohamud as President, and wished him well in the “noble task” of bringing normalcy and stability to Namibia’s sister country. The international community should continue to support the people of Somalia as they embarked upon the path to rebuild their country. For many decades, the people of Western Sahara had been denied their inalienable right to self-determination and independence. Namibia reiterated its call for the immediate and unconditional implementation of the United Nations Settlement Plan leading to the holding of a free and fair referendum. Equally, Namibia wished to reaffirm its unequivocal support for the inalienable rights of the Palestinian people to self-determination and national independence, based on the relevant United Nations resolutions. In addition, he said, Namibia reiterated its call for the immediate and unconditional lifting of the embargo against Cuba. Namibia attached great importance to sustainable development and the search for the best ways to mitigate the adverse effects of climate change. In that context, it sought the support of Member States to host the Secretariat of the Green Climate Fund in its capital city, Windhoek, which would provide an opportunity for a developing country to host an important United Nations agency. Finally, he said, the reform of the United Nations and its principal organs should aim to strengthen the Organization to make it more efficient, effective and responsible to the needs of all its Members. Strengthening the role and authority of the General Assembly was of paramount importance, as was reform of the Security Council, given its primary responsibility for the maintenance of international peace and security.